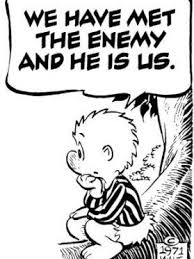 The Freedom Fighter's Journal: "WE HAVE MET THE ENEMY AND HE IS US"
Bloody civil war is no longer a distant possibility - today it has become inevitable. Perhaps one James Woods said it best on Twitter (@realjameswoods) over the weekend: "I've never witnessed such hatred for a man who is willing to work for free to make his beloved country a better place. It is pathological." Yes. We have to realise that the Islamic stuff could be kept from invading us . The enemy is here with us. The prize is for those patriots who can take head off snake.